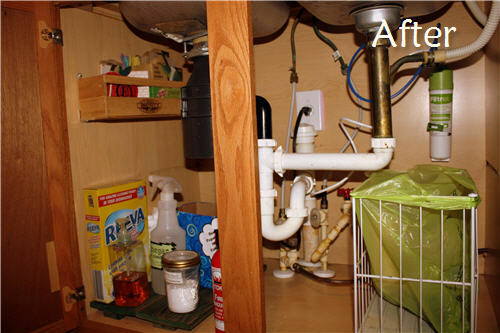 I don’t have a lot of storage room under my kitchen sink. 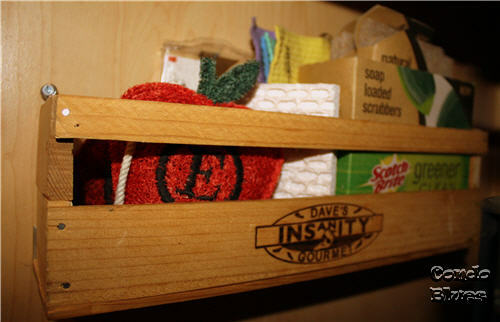 A slide out trash can (love, BTW) fills the right side of the sink cabinet. 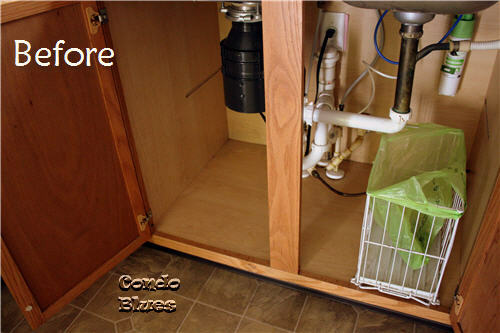 The garbage disposal fills the upper air space on the left side of the sink cabinet. 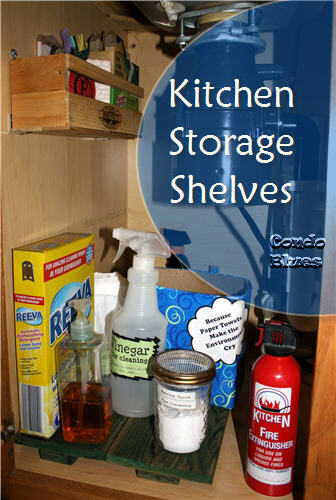 Soaps and cleaners, and extras on deck hang out on the left side of the cabinet and are in the line of fire when the garage disposal violently decides it doesn’t want to connect to the waste water pipe and floods the cabinet with water and food goo. After trying to dry out a cardboard box box full of dish washing powder three times in two days, I figured it was time to install shelves under the sink to keep my extras high and dry. Keep reading! 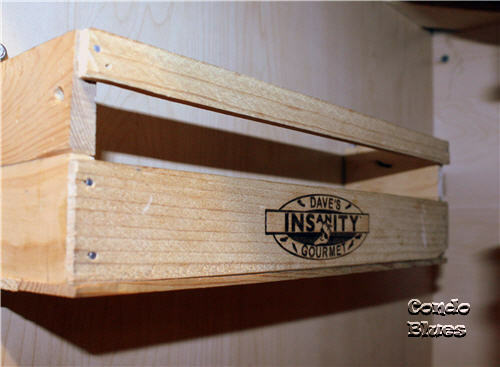 I'll teach you how to make my wood crate shelf. I couldn’t find what I wanted in a store. Then I remembered I have mad DIY skillz and a bunch of wood. DIY to the rescue! I designed and built a under sink shelf from an old hot sauce caddy. 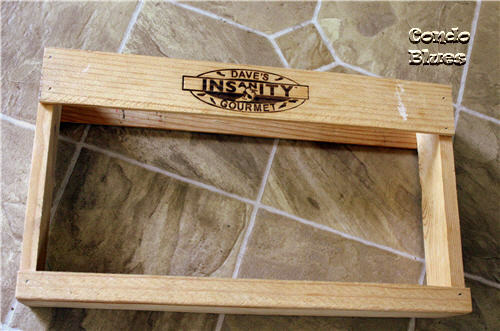 Husband likes hot sauce so much we got a Dave’s Insanity sauce gift pack like this as a wedding present. True story. I took the hot sauce crate apart using the same technique I use to take apart a big wood pallet. I used a pry bar and a hammer to loosen the where the boards are nailed together. The wood is thin. Be careful. You don't use too much force or you may split the wood. Then I used my Dremel instead of a reciprocating saw to cut the nails while carefully avoiding the wood. I made the bottom of the shelf using wood glue and a staple gun to attach the original bottom piece and one of the top rails together. 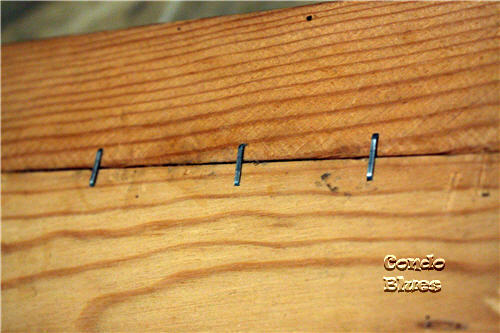 Staples are not my preferred choice but this wood is too thin to use biscuits, pegs, or pocket screws. 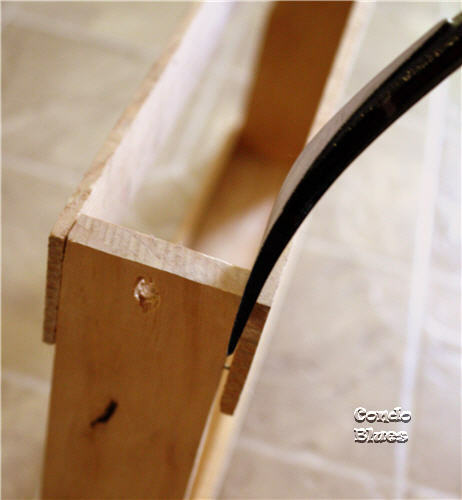 I cut the original caddy sides in half and used wood glue and a clamp to make deeper sides for my shelf. 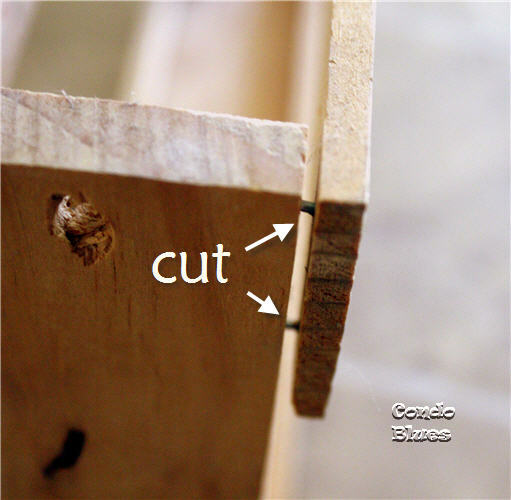 Use wood glue to create a strong bond. White office glue won't hold up for this project. When the wood glue dried, I nailed the sides to the bottom of the shelf. I don't know what exact size these nails are. They are small I-had-them-in-the-garage size. 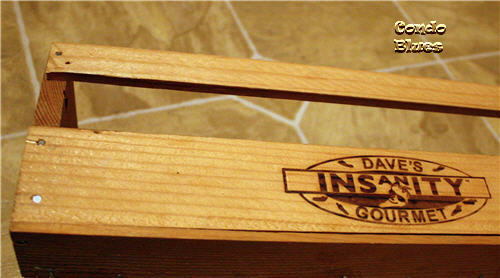 Finally, I nailed the wide Dave’s Insanity Sauce piece to the bottom front and sides of the shelf. Then I nailed one of the small rails from the hot sauce caddy to top sides of the shelf. I screwed the organizer to the inside of the kitchen cabinet. It keeps my extra scrubbies and sponges from cluttering the bottom of the cabinet while they are waiting to be called for duty. The kitchen cabinet doors are too thin to screw a shelf to the inside of the door to keep the dishwasher detergent and larger cleaners dry in the case the garbage disposal blows its top and floods the bottom of the kitchen cabinet. I made a simple set of what I’m going to call risers to save boxes and such from melting in a puddle of water under my kitchen sink. I had cut and painted fence wood left over from another project. Let's go with reclaimed because it sounds so much nicer than I hauled a broken fence home from the side of the road. Roadkill Rescue would be proud. I sanded three boards smooth. with my Mouse detail sander. 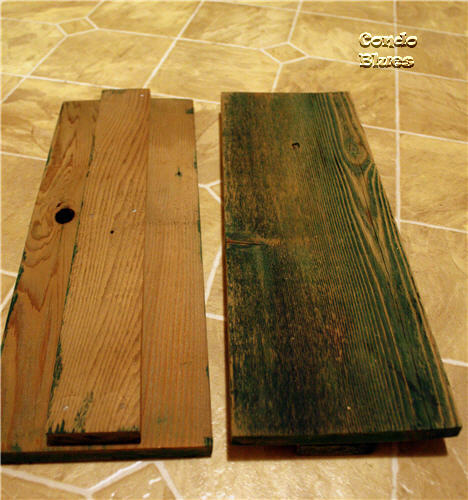 Sanding knocks down the roughness (and keeps stuff from tipping over the ridges in the weathered wood) but keeps the character of the weathered wood. I got a nice distressed look by happy accident. I mean, through careful thought, planning, and expert technique. You buying that one? Yeah me neither. I cut one of the boards in half length wise. 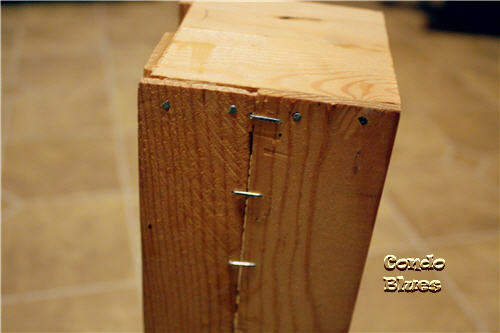 I used wood glue and nails to attach one cut board to the center bottom of each kitchen cabinet riser shelf. I sprayed the top and bottom of the risers with a coat of matte polyurethane to protect them from water. My dishwasher is fickle. It only likes the very expensive powdered eco or the very cheap powdered but not so eco detergent. After ruining a box of the good stuff, I replaced it with the cheap. Sorry environment, I bowed to the budget on this one. It is not the most elaborate solution but it works. The price can't be beat - free! Perfect place for a little extra storage! Um... that little shelf is amazing! Love it! Brilliant! Both of those shelves are super smart to keep your stuff up off the ground. I love it! Thanks for sharing this at The CSI Project!